Part 2 of this four part Guide To Roof Construction covers pitched roof tiles, basic pitched roof designs, cold and warm pitched roofs and pitched roof construction. 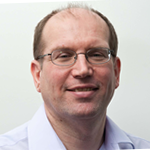 To get the most out of the information it my be worth reading Part 1 first to get an overview. Part 1 – A Guide To Roof Construction: covers an overview of flat and pitched roofs. Part 3 – Pitched Roof Detail: covers pitched roof detail: roof ridges and ridge tiles, roof hips and hip tiles, roof valleys, roof verges and lead flashings. 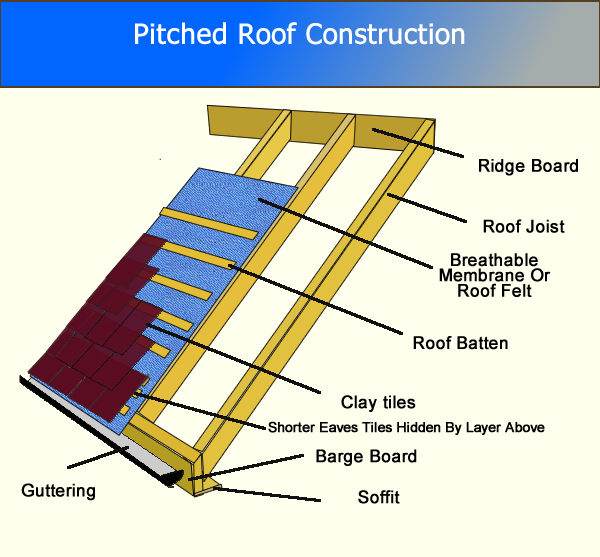 Part 4 – Flat Roof Construction: covers flat roof materials and flat roof construction of warm and cold roofs. A standard clay roof tile is 265mm x 165mm although there are other size and shapes available. This would typically require 60 tiles / m². There are two basic shapes that most roofs use in their design: gables and hips. 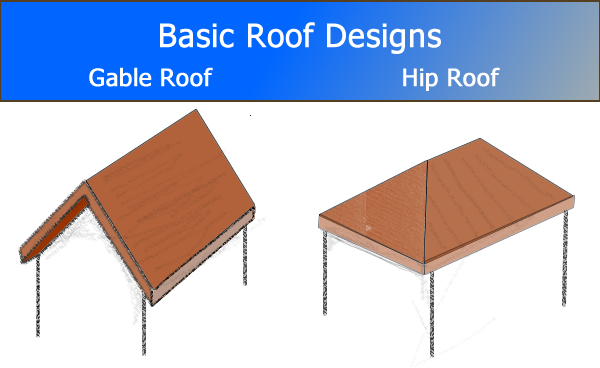 A complex roof can include elements of both of these. A hip roof needs a different tile to go round the edge of the roof. This can either be a ridge tile (shown in the picture above) which is mortared in place or a special tile called a hip tile. 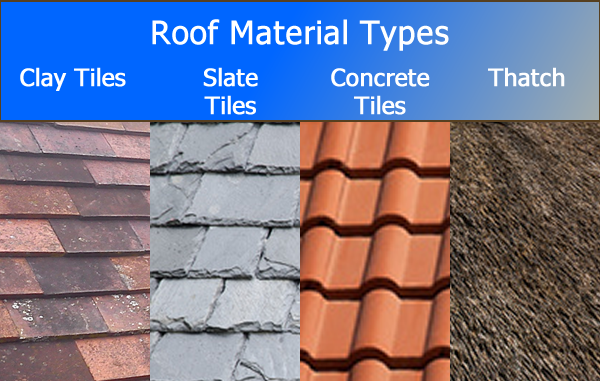 See Part 3 for details on ridge tiles and different types of hip tile. The majority of houses with pitched roofs will have what is now called a cold roof, where insulation is laid on the floor of the loft area, immediately above the ceiling of the upstairs rooms of the house. This means that the roof space is at close to outside air temperature. This is fine for most houses. However if you are looking to use the loft area as an extra room or maybe you live in a barn conversion where the roof rafters are exposed then it is not practical to insulate in this way. 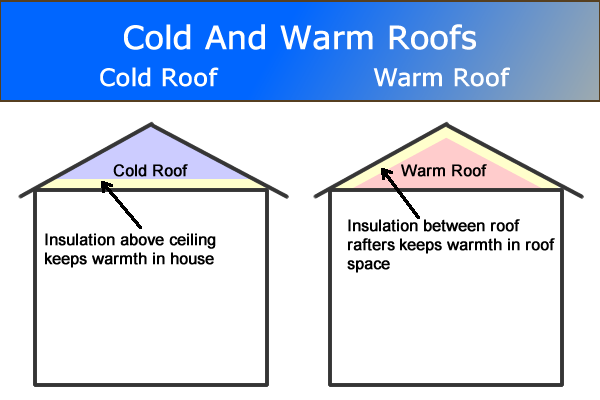 In these cases you need a warm roof where insulation is inserted between the roof rafters so that the roof space can be heated and will be at house air temperature. 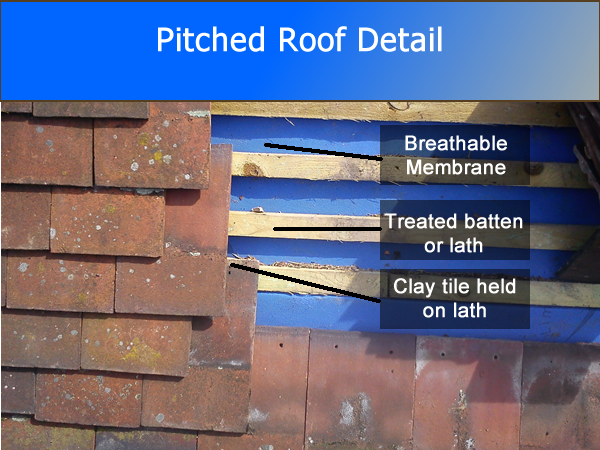 A breathable membrane or in older properties roofing felt (also sometimes called sarking felt or slaters felt) which keeps the rain out whilst the roof is being built and offers secondary protection to any water that gets through the outside layer of the roof. The membrane is laid over the joists and fixed with nails. The nails are hot dipped galvanised or stainless steel to ensure they can withstand moist conditions. In properties over 50 years old then the felt or membrane may well be missing. Instead a form of mortar called torching may have been used on the underside of the tiles to keep them in place and avoid the wind getting behind them. Wooden battens (also known as lath) which are now usually tanilised (pressure treated with tanilith) to protect them from moisture. The wooden battens are fixed onto the joists with nails through the membrane. You may also see red battens which are generally pressure treated to conform to BS5534 standards used for NHBC (National House-Building Council) warranties. All battens should have the origin, dimensions and relevant British Standard marked on them. Where the tiles meet the gutter is called the eaves. An eaves course of tiles is normally shorter than the rest of the tiles used and is normally invisible when the roof is complete as it is fully covered by the layer of tiles above. It is there to provide a second layer of tiles for waterproofing. Read Part 3 – Pitched Roof Detail: covers pitched roof detail: roof ridges and ridge tiles, roof hips and hip tiles, roof valleys, roof verges and lead flashings. Pure Roofing is the most up-to-date definitive roofing guide there is. It’s exclusively focused on the design, detailing and specification of pitched roofs. Another good article, I really like your stuff. I often bring it up on the I Pad when talking to customers, do you mind me asking, what do you use to create the blue box type chart images? Thanks for the feedback. The images are created using Adobe Fireworks although pretty much any image editing package such as Photoshop or Illustrator could be used.